As some of you may remember from the Vanilla Creme Cookie Challenege, a few months ago I embarked on three month, no chocolate fast. I didn’t mention that at the same time, I decided not to drink any soda or carbonated drinks as well. During those months, I started drinking lots of juice – cran-apple, lemonade, Kool-Aid, etc. One problem with this new habit is that these drinks, while not all syrupy and bubbly like soda, still are laden with sugars and aren’t really that healthy for you. Enter the Jack LaLanne’s Power Juicer Express. This juicer is a perfect way to have natural, fresh juices in the comfort of your own home every morninmg. It is very easy to use, simply throw pieces of fruits or veggies down the chute (you can cut them down to size if needed,) then press them through the filter/blades using the “pusher.” The juice comes out of the spout and into your cup. This is best for single-servings because I (unfortunately) learned the hard way that if the edge of your extra large cup is too high, it closes the spout, making all the juice collect inside the juicer until it could potentially overflow. I should mention that they caution about this in the directions, I was just so excited to make the juice that I didn’t read the instructions thoroughly. I recommend that you learn from my mistake and take the time to read all instructions. In terms of power and operation, one tester said, “It looks like it has the power of a machine that requires a permit, but is so easy to use, it could be a child’s toy*” (*But please do not give this to your child as a toy. It is a juicer, not a toy!) Another tester felt that it was like having a “mini-juicing factory – union, machinery, workers & all – in the comfort of your kitchen.” Sometimes the juicer shakes a bit as it’s pulverizing your fruit, but fortunately, it is sturdily built and has a metal locking bar to keep the top on, ensuring that pieces of fruit don’t go flying across your kitchen. The Jack LaLanne Power Juicer Express comes with a recipe book with several suggested fruit juice recipes and even some soup, side, and dessert recipes that use various other fruit and veggie pulps. My fellow testers and I tried out three different fruit juice recipes. The ‘Sweet Surprise’ got rave reviews while the ‘Lemon Lime Zip’ and the ‘Juicy Adrenaline Rush’ fell victim to some not-ripe-enough fruit. One thing to remember is that since these juices are all-natural and freshly made, all of the flavor comes directly from the ingredients you add. Since you’re not adding extra sugar, it won’t be as sweet as artificially flavored drinks, but they will be much, much healthier. The juicer is also very easy to clean. The base can be wiped down with a cloth or sponge – since it has a motor, we don’t want to get it too wet. The other parts can be washed in warm, soapy water or put into the dishwasher (but they recommend cleaning the pusher by hand.) It takes a little time to wash the filter/blade because the holes are very small, and it’s a little harder to get some of the fruit “debris” out of them. I used a plastic bag in the pulp collector, as they recommended, so that was super easy to clean. Tie bag up and toss into trash can. It’s really hard not to justify having a juicer in your own home. The benefits of having fresh and natural fruit juice can’t be debated. It’s also an easy way to get some of the daily recommended fruits and vegetable servings, which I’ll admit I have been unable to consistently adhere to so far. And in addition to the healthy diet, you’ll also be getting good “karma points” since you’ll be supporting the OCNA cause. The WCatDD Jack LaLanne Power Juicer Giveaway! 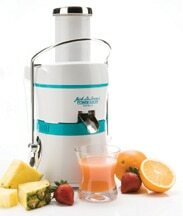 One lucky winner will receive: One Jack LaLanne’s Power Juicer Express, a ~$100 value! I'm not overly fond of juice I get from the grocery store, but I love fresh juice. I'd probably start off making pure, simple orange juice. [email protected] Apple/Carrot Juice would top my list. I would probably experiment… apple with strawberry maybe. This is a very generous giveaway & I would love to win it! I would make a strawberry banana drink. I am starting a new diet for health reasons and will be using only organic vegetables and fruit to make morning juices. I would *love* to make fresh carrot juice, tomato juice, and fruit juices like cantaloupe and honeydew. That would be amazing, thanks!! I would make orange-carrot juice! My husband loves tomato juice, so I would start with this one. Thanks! I've always wanted to make some sort of juice with carrot in it. I would make water rmelon juice after reading from their site about how healthy it is to drink. i'd love to make an apple/spinach juice with this. i have a juicer, but it's so big and cumbersome that i never use it. I'd make a lot of veggie juices and I would definitely try the Daily Detox recipe from the site. I LOVE juice, especially fresh juice! I think I would like to make a tropical blend juice! I would love to make a juice with oranges, pineapple and apples. All my favorites. Thanks so much. I'd make some pineapple orange juice. I would love to make orange pineapple juice. I like carrot, apple, and fresh ginger juice. I would make apple juice. It's so good freshly juiced. I've always wanted a juicer. A green 5 Alive would be our start, and then we would add more veggies and fruits!!! We've got alot of health issues and I think this would be a HUGE help! i would make a special orange juice! I would love to make a carrot/orange juice. I would love to make a carrot/orange juice.Thank you so much for the chance to win. I would have a fruit one with the fresh blue berries, raspberries and strawberries we put up. I would also try one with some collards, carrots and pine apple…I don't know why but I think that would be tasty. Pineapple strawberry juice would be delicious! I would want to try the Pineapple wheat grass. Pineapple is great and the wheat grass juice I used to get a jamba juice made me feel so good! Thank you for entering me! Fresh tomato juice with all thefresh tomatos we have every summer and maybe muscadine juice would be good too? This may seem kind of simple, but I'd love to start making my own orange juice. I'd make orange juice to begin with! Oh my. I don't know what I would make. I'd just keep adding fruits and veggies until I like the taste!!!! I don't know what I'd try! I'd just keep adding fruits & veggies until I got a flavor I liked!! I would make fresh fruit and veggie drinks. People think veggie drinks are gross but even leafy greens with apple are delish ! I would make a carrot, apple and strawberry juice. I would make a vegetable/fruit juice (kind of like V8 Splash)! I would love using this to make lemonade. I'd make carrot juice and apple juice. There's nothing like a freshly-juiced apple! I would make apple, pear and ginger juice. I'd probably go for straight up orange juice to begin with, but I would sure research out other yummy juice combos right away!! Pineapple and apple sound great. Carrot and orange juice. Thanks. Apple Juice fans here!! Thanks for the chance. I would make fresh apple juice! Yum! I would make vegetable juice for the times when I do a detox/cleanse. I would like to try apple/banana/orange juice in it. Thanks! I'd like to make a strawberry, raspberry, orange juice! I'd toss together all the fresh fruits I have available that seem compatible. I'd like to make some fresh strawberry/pineapple juice. I am a HUGE sucker for my OJ so I might start there but… I have a hard time getting my potassium in so I might try some with banana! Strawberry banana would be the first drink I would try. I would make orange and grape juice and then experiment with various juices, thanks for the chance! Apple, beet, plus protein powder. Juicers are important for people who have a hard time eating, who need a high calorie content with ease of swallowing. When I was little we used to make apple, banana, strawberry smoothies with the apple juice from our juicer. I'd love to make smoothies for my kids with fresh juice! I would make fresh fruit juices. Thanks for the giveaway. I've always wanted one of these and that they support ovarian cancer awareness makes me more interested in this brand. i would make beet and carrot juice. yum! Everyone in my house loves orange juice!! Mmmmm fresh orange juice! I would make fresh fruit juice with no sugar added! Hmmm, so many possibilities! I'd start with the basics, like apple/carrot, or apple/pear (perfect time of year for apples! ), then move on to advanced juicing – like apple/spinach/lemon, or kiwi/orange/mango. I've always wanted a juicer – sooo healthy! Thanks for the great givaway!! I'd try some crazy combination – blueberry orange, or raspberry strawberry – just to see what I could do! I would make a multi-berry juice with raspberries, blackberries and blueberries. I would make:Calcium Drink Recipe1/2 cup fresh broccoli pieces3 medium carrots, greens removed1 applesmall handful fresh parsley1/2 lemon, peeled (optional)Process the ingredients in a juicer and serve. Process the ingredients in a juicer and serve. I'd love to win – I'm growing apple, fig and orange trees organically in my yard, so this would be perfect! I've got lots of strawberry plants…so strawberry juice! I love pear and peach nectars, so I'd definately be trying those juices first. I would make strawberry banana pineapple heaven! Right now, I would make tomato juice. By the way, I live about 5 miles from Jack La Lanne, see him around. This is a great investment and i am sure that whatever your tastes are, you can make a drink to your liking. I like this product because i really enjoy fruit and i would love to make my own special fruit drink. I'd make Watermellon, strawberrys, and cantelope surprise and I would call it Waterstrawlope juice! I would make a carrot, cucumber and celery juice to jump start my morning. I would like to say that I would juice vegtables for a healthy drink, like broccoli, brussels sprouts, spinich etc……but the picture of the juicer with the fruit has reminded me of Pink Laylahne''s, orange juice with strawberries, mmmm. I would like to make carrot juice…heard it is really good! Apple/Pinapple/Orange Juice sounds good to me. My husband and I have been really wanting a juicer. I really love that they donate proceeds to Ovarian Cancer Awareness. It's a silent killer. I almost lost my mother to it at age 45! She is thankfully in remission but had gone improperly diagnosed for over a year and it had spread practically everywhere! I would love to make some orangeade. i would make pineapple-orange-carrot juice. thanks! I would make a strawberry & banana drink. I'd make the pineapple wheatgrass juice. 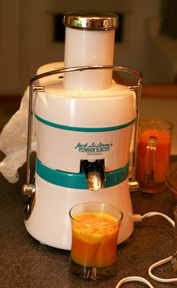 I would combine mango, papaya, and pineapple to make a power juice with Jack Lalanne's Power Juicer Express. Love that man – he changed the way America exercises and eats!!! I would make Fresh Carrot, Apple & Ginger Juice. I'd love to try some pineapple juice. I LOVE fresh grapefruit juice!!! I'd love to try some pineapple juice.Thanks for doing the giveaway! Oooo. Would love to win one of these. Have some health problems that juicing would be a great benefit to but can't afford the $6+ is costs to get from a juice bar here in New York. Love that the new model benefits ovarian cancer research. Would love to make some greens drinks with apple and ginger. I would make apple juice. My husband has Crohn's disease, and this would be a perfect way for him to get more fruits and veggies into his restricted diet. I like to make a green juice smoothie with spinach and blueberries! I would make a fruit juice. I juiced vegetables for 6 months when I got cancer back. YUCK!. I would use apples strawberries and bananas. I would use this to make a cup of fresh grapefruit juice everymorning. I'd make peach & strawberry juice with some carrots thrown in. This would be WONDERFUL to win–nutrition is so important, especially being pregnant with little kids! I would simply love to squeeze fresh grapefruit juice and more! I would make Carrot/Apple juice… YUM! Thanks! I would make an apple, orange, strawberry and carrot juice! Every since I seen the info commercial for Jack Lalanne's juicers I have wanted one but sadly with one income its just not in the budget. My kids are into sports so I want them to try and eat healthier, I also keep putting off losing the weight I have put on. If I was lucky enough to be the winner the first juice I would make would be carrots with apples as these are 2 good fruit and vegetables to have daily.I would also make a citrus blend with limes, oranges and lemons. I would save money by making juice at home. Thank you so much for the chance to win a way to a healthier family. I would make some mixes like orange strawberry! I would make an apple, pineapple, orange juice because that would be tasty and it is the fruit that I happen to have on hand now! I'd love to make a cantaloupe and strawberry juice! I like to buy or grow organic vegetables and I would love a juicer like to juice some of them. I'd make carrot-apple juice, my favorite! I would make Pineapple orange first because it is my favorite, however the possibilities are endless. I have always wanted one of these. I used to watch the infomercials when I was a kid.I would love to try a fruit juice mixture…everything that I have in my kitchen…apples, bananas, a few frozen berries, and maybe even a few carrots! I have always wanted one of these. I used to watch the infomercials when I was a kid. I would love to try a fruit juice mixture…everything that I have in my kitchen…apples, bananas, a few frozen berries, and maybe even a few carrots! I would make my strawberry-banana smoothie, of course!! I'd make carrot apple juice. Yummy! I love juce, i would love to be able ot make apple and orange juce! I would try all different kinds of combination of my favorite fruits. mangos, strawberries, pineapple, kiwi, peaches, blueberries, rasberries, oranges, lime, cranberries. I would make orange juice. I would love to make my own fresh tomato juice. Carrot and pear juice, you must try it… AMAZING! :)I also love Cucumber and watermelon juice. I used to juice a lot but my juice blew up whilst I was pregnant and trying to get extra veggies in my diet, Thanks for the opportunity to win another one! I also love Cucumber and watermelon juice. Thanks for the opportunity to win another one! I would love to make Orange Juice!! I would make carrot juice. i like carrot juice with celery. I would make strawberry orange juice. I would make apple juice with grapes too. I would make fresh carrot juice, yum. I would make orange juice. I love fresh squeezed oj. I would make a carrot/ orange juice. Pineapple grape-strawberry juice, that would taste so fabulous I think. Ah, this would be the perfect way to start my diet! I would make an orange, pineapple-mango juice!Yum! Yum! Yummy!Thanks for the chance to win!Good luck to all! I would make an orange, pineapple-mango juice! I would love to make Kiwi juice! I love juice. I would make banana and strawberry juice. I get a lot of citrus in the winter & would make lots of citrus juices. During the entire year, I would like to make juice that includes greens, like spinach, for my health. I just read a juice recipe the other day that had spinach and blueberries. I would love to try that. Thanks! I'd use this to make some weird combos of juice to include fruits and veggies, so maybe like a carrot grape juice etc.. I would make orange mango pineapple juice. Its my favorite. I would make some vegetable juice first then some fruit juice. I will make the Melon Shooter juice. I would make something tropical like mango, strawberry, pineapple. I would make Apple-grape juice for Ian, he loves it. Please count me in. Thanks for the chance. I would mix tropical fruits for a refreshing treat. Ugh- sorry, thought this was a form since it had a box- pls delete- I did in the entry form. I would make a berry blend juice. Thanks for the giveaway, I love to watch the infomercial for this!! I would try the Emeril's K-Cups first. I would definitely always have a “miscellaneous” juice…meaning a combination of fruits and vegetables and everything you could put in that would be healthy and (relatively) tasty. I would definitely be experimenting with fresh veggie juices as they taste so good fresh and would try to make some pineapple orange juices too. I would start with plain simple oj – and go from there!! I think I'd start off with some kind of juice w/pomegranate and blueberries. I would make starwberry juice! I'd love to make fresh orange juice first. Then add other fruits like pineapple to it. Yumm. Thanks for the chance at this! I would like to make the 'Melon Shooter' with the Jack LaLanne Power Juicer. Thanks. I just subscribed to WCatDD by emailvac924 at gmail dot comThanks! Here's a link to my tweet. I'm dragonfly777http://twitter.com/dragonfly777/status/5156219125vac924 at gmail dot comThanks! I would make apple/carrot juice. I love Fresh Squeezed Orange Juice so my first use would be to make myself some Orange Juice. I would make mango-peach juice. I'd love to make fresh grapefruit juice. Yum! Well I know how healthy broccoli is so I would love to have a juice with broccoli and to make it sweet I would probably add berries and apples. I have heard great things about carrot juice and I would add pineapple and pomegranate! I'd love to be able to make orange/pineapple and blueberry/pomegranate juice each morning with this terrific juicer — thanks!! I think I would have to make something to use up the fruit from our CSA- apple/pear/plum juice? I would like to make some fresh apple juice, carrot juice, orange juice, grape juice and many more. I think I would make cantelope juice. Thanks for the giveaway… We would make an orange-mango-pineapple-apple-carrot-garlic juice !!! I would first try to juice some nice plump oranges! I want to make maybe something like pomegranite-blueberry blend. There are so many fruit and vegetable combinations I would try, like carrot, apples and beets. Or pomegranites and pears. I would make orange juice with the Jack LaLanne Power Juicer Express. I would make papaya, banana, strawberry juice.